Your pool represents a significant financial investment. Heating your pool enables you and your family to enjoy your investment more than just a few months a year. Heating your pool enables you to comfortably enjoy your pool earlier in the spring,evenings, after work, and later in the fall. A warmer pool means more time for family fun, more opportunities for energizing exercise, and a more comfortable place for family and friends. We think so. A solar pool heater can be less expensive up front than a gas heater, depending on the size of your pool. Once a solar pool heater is installed, your heat is FREE from the sun. With a gas heater you could pay the gas company as muchas $300 a month to comfortably heat your pool. Also, solar is non-polluting, and it can COOL your pool during hot summer months, something NO gas heater can do! First, check the operating costs. Will you really be willing to pay the gas bill, or will you shut off the pool heater when you need it most? heating systems can last 30 years. Lastly, what are you really trying to accomplishwith a pool heater? 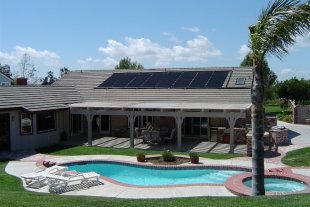 If you want your pool to be a comfortable swimming temperature all season long, then choose solar. No. Solar pool panels and controls are designed specifically to heat a large volume of water in a swimming pool, and to operate in temperature ranges of 80 to 100 degrees. Household space heating and household hot water are different applications of solar, requiring the heating of smaller volumes of water to higher temperatures. Find out more about how solar can heat the water in your home.